It’s been a chaotic and tragic Australia Day here in Queensland, New South Wales and Victoria. 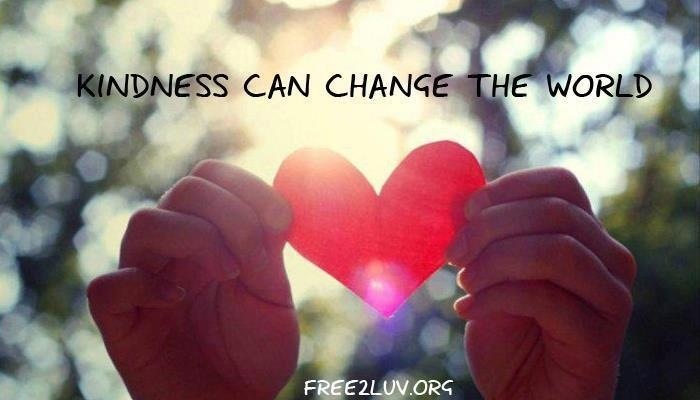 We are now in full “get back to normal” phase, thanks to all the hard working Emergency Services personnel and the hundreds or thousands of volunteers. I’m laying here in my bed looking at a limited view of the scenery and wishing I could do more than offer my prayers in my meditations. I have to be grateful I’m not underfoot and need to be rescued! 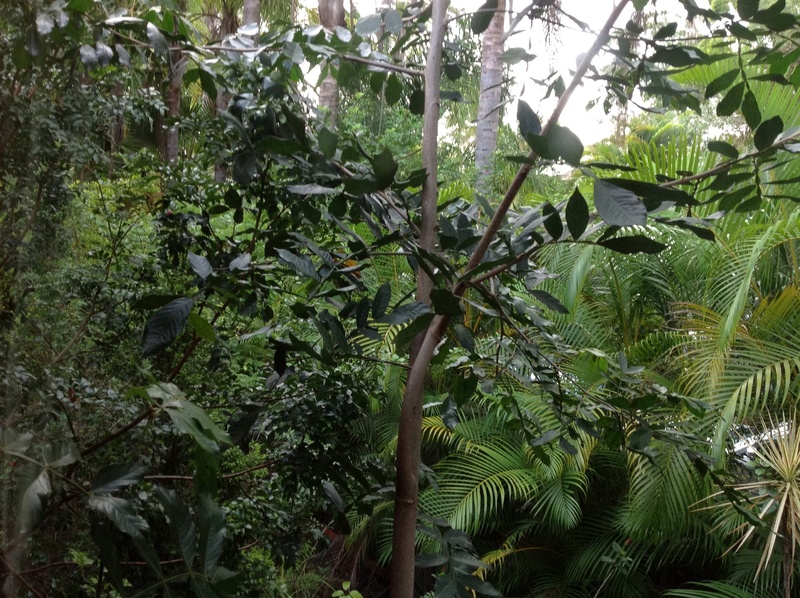 The jungle of vines tangled with the palms from my first floor bedroom window. I have the strangest view at times since I’m so high off the ground. Like this bud outside my window, 25 feet off the ground yet looking so fragile. 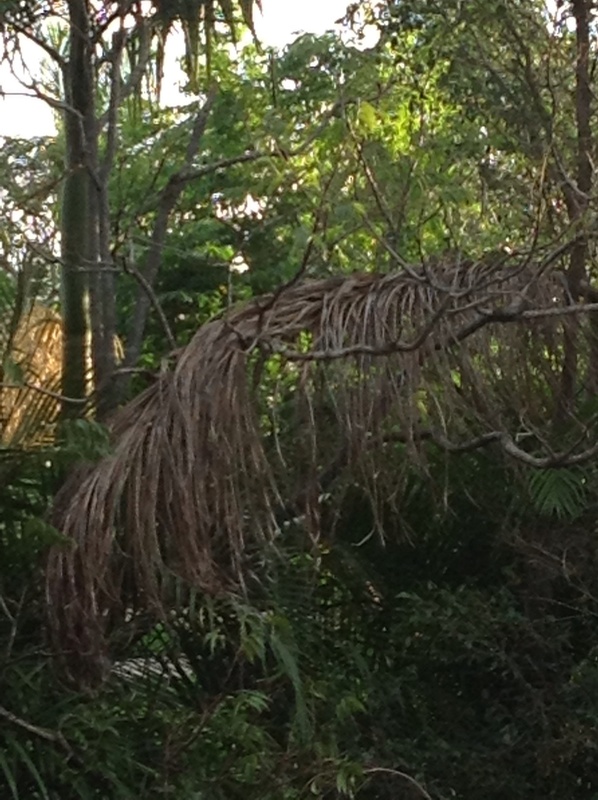 Dead palm fronds are hung up by neighbouring trees, just waiting for the right moment to fall. They sound like a mini explosion as they hit the ground. Too high to remove we have to wait on nature to take a hand. 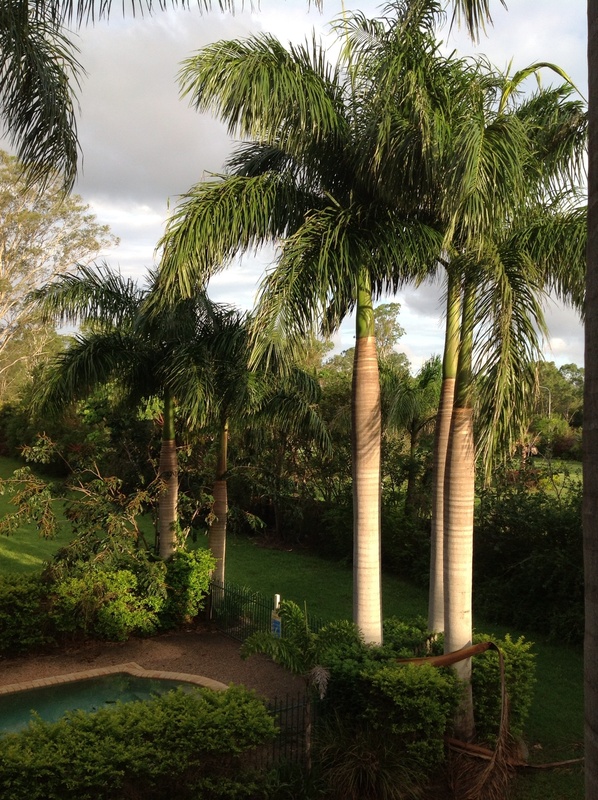 You can see how tall the palm trees are. These are the smallest of those near the house. At their feet you can just make out the fallen fronds we have yet to clear away. These two came down last night. The little billabong/ dam filled after the rain. The small dam/ billabong filled overnight with the rain. It’s hard to see with all the weeds which had taken over. It looks so picturesque at present. 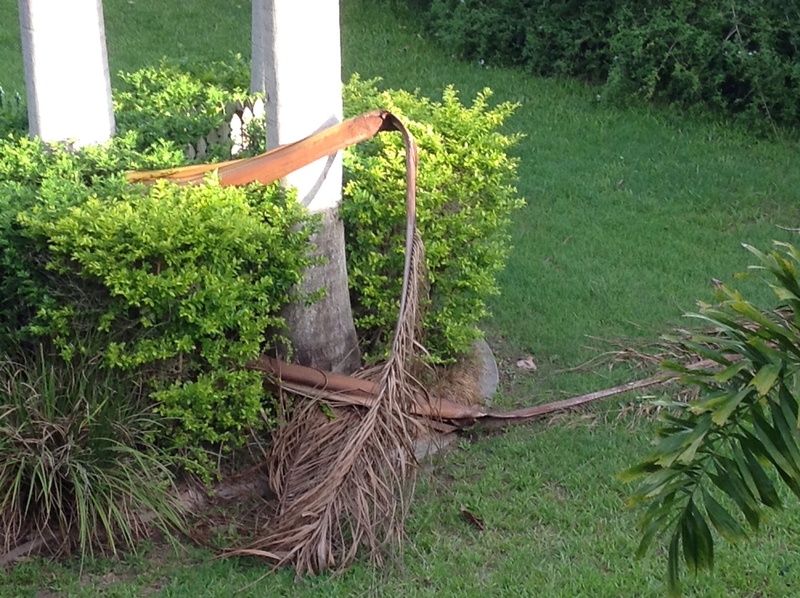 All the dead palm fronds have been cleared away. 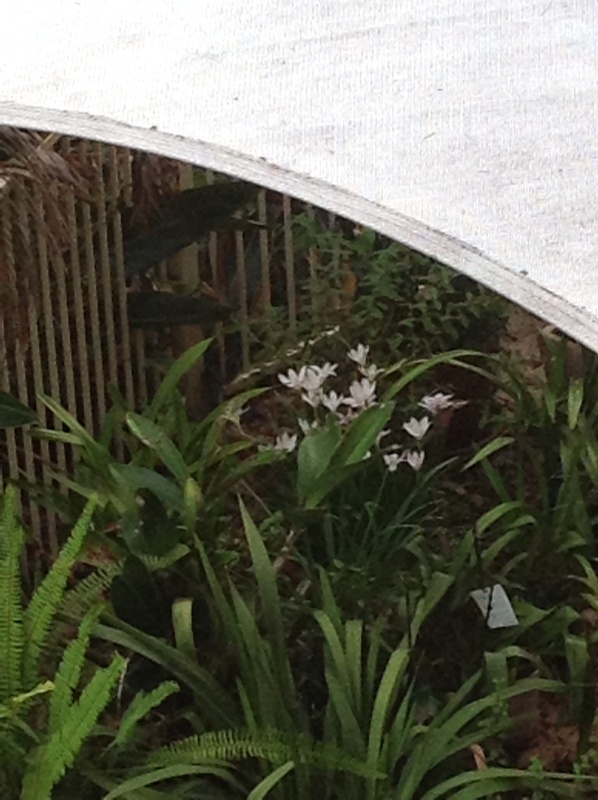 Hiding in safety, my fragile lilies are flowering beautifully after the fresh rain. Nothing is better than sweet rain for them. 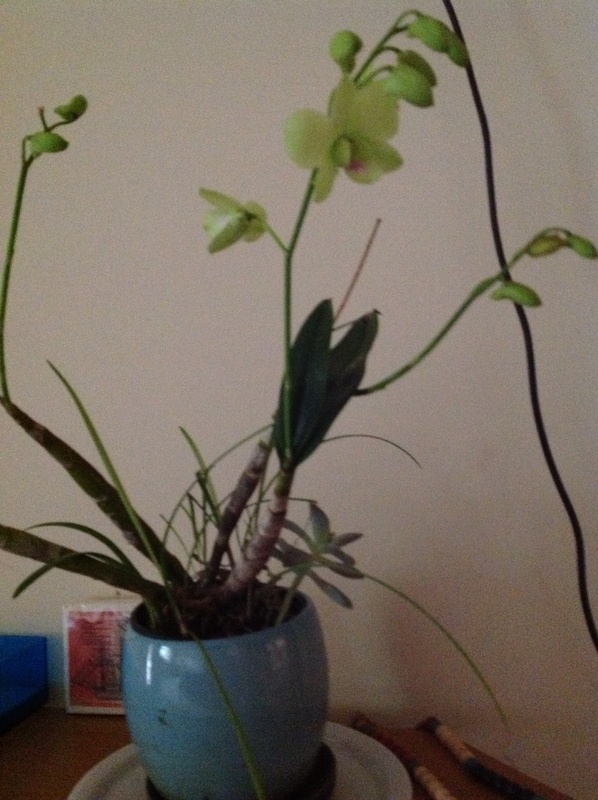 Pale green orchid rescued before the downpour. Even more fragile my small green orchid. I’ve been watching the buds form all week so my husband made a rescue dash to bring it inside to flower for me. Everything looks peaceful and lush. 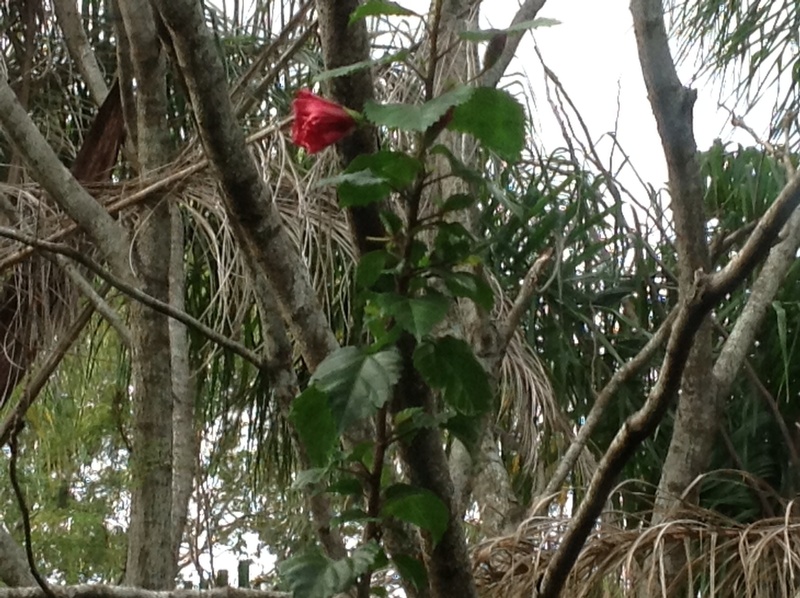 Red hibiscus bud framed by dead palm fronds. the entwined limbs of all the plants show off their different hues. Life blossoms around us, even 25 feet in the air! 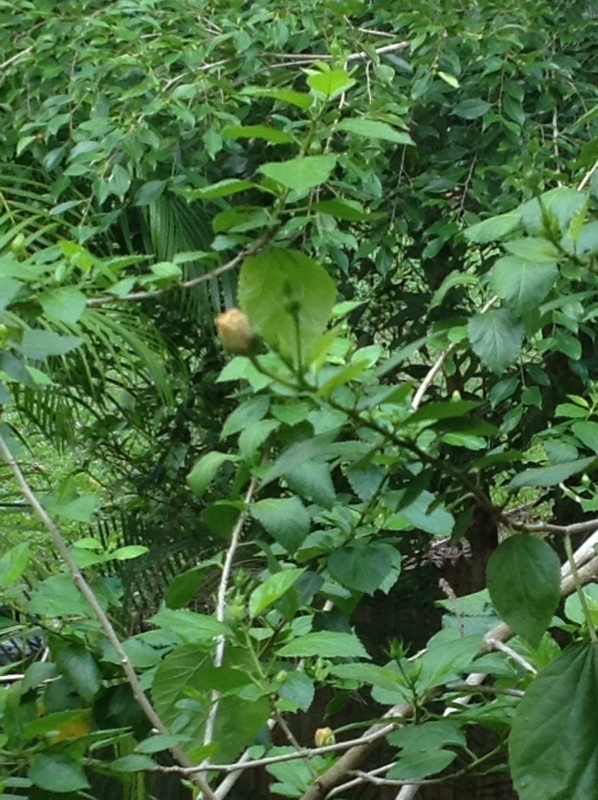 This red hibiscus bud would be 35 feet high yetis surrounded by dead palm fronds waiting to shake loose. 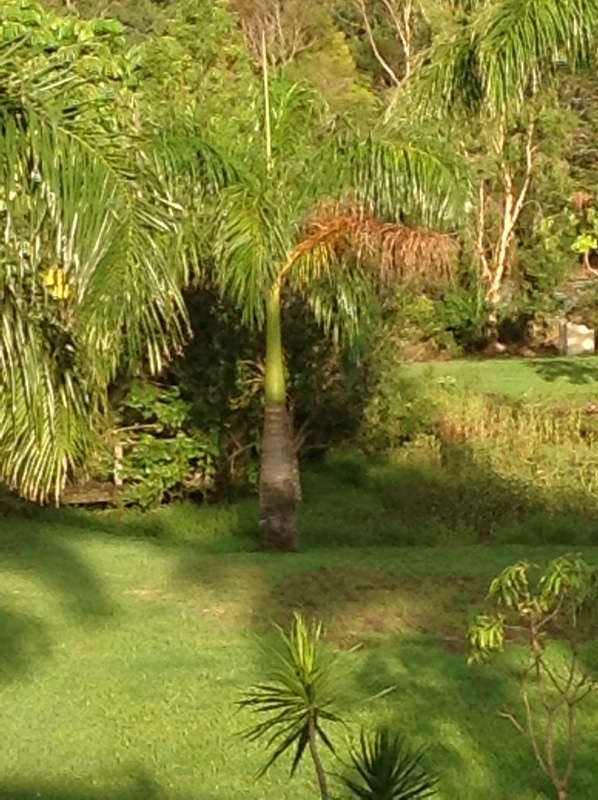 The long cane it waves to and fro on will whip it out of the way as the fronds come down. Fragile yet strong, amazing isn’t it? So from my home to yours, I wish everyone love and peace. I pray everyone finds a safe harbour in the storms. I look forward to seeing everyone well and happy as soon as possible.